When it comes to moving, you don’t just want any old Del Boy carting your gear around town. You want a reliable, professional man and a van in Peckham to transport your prized possessions quickly, safely and without costing the Earth. That’s where Happy2Move come in. 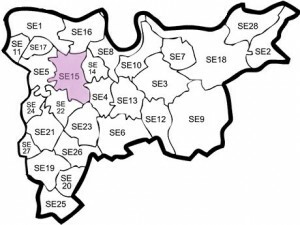 Contact us today, and our small moves team will be there to help you around Peckham and the whole SE15 area. We even be there at short notice. Far from a hot-bed of wheeling-dealing, Derek Trotter types, Peckham is rapidly becoming one of the most sought-after locations in South London. Benefitting from heavy EU investment, the area boasts an award-winning library, a new town square, the improvement of the South London Gallery and more. Such developments have inspired scores of people to move to the area from neighbouring Bermondsey, New Cross, Camberwell, East Dulwich even further afield. When they do, many of them call our man and a van in Peckham to help them move. Your man and a van in Peckham is a fully trained, fully-equipped moving professional with a wealth of experience in helping people just like you move to and from Peckham. Not only that, but you can rest assured that your driver comes armed with an enviable local knowledge of the SE15 area and its roads, getting your goods from A to B in no time at all, whilst ensuring they’re safe and secure in transit. With services from as little as £45 with no hidden fees or hourly rates, contact us today to hire a man and van and see why, when it comes to moving in Peckham, only fools do it without Happy2move.